Why choose ModBox for your Garden Room Gym? Looking to move your exercise regime closer to home and save time and (membership) money going to and from the gym? 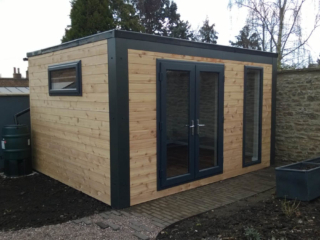 A stylish garden room gym from ModBox Spaces is the perfect solution whilst bringing an attractive feature to your garden. Work hard in the privacy of your own garden, and then relax outside on the decking with something cold. Based locally in Cornwall & Devon, but covering the whole South West, the ModBox team is perfectly placed to look after your garden room project, annexe or lodge. With over 60 years combined experience in construction, you can be assured that your project is in safe hands. We pride ourselves on a ‘from first sketch to receiving your keys’ approach and design every building specifically to our client’s needs. We have plenty of back catalogue designs for inspiration but it is the sense of each building being a brand new project which really sets us apart. We are also very clear about our pricing. Our service is literally from ‘first sketch to receiving your keys’. No hidden extras, no items left unattended, unless you expressly ask us to, and all changes to specification and upgrades are carefully included in the final quotation. We believe that this is how business ought to be done and find life goes along rather more happily as a consequence. We even offer a planning service should your garden room not fall under permitted development rights. The other thing we are passionate about delivering is truly year-round spaces. The ModBox 150mm wall construction is our tried and tested specification which creates a comfortable, low-running-cost building; to all intents and purposes, a mini-house…. We look forward to working with you to bring your project to reality. From experience, we find that prospective customers love to see our previous projects in-use by happy customers to get an idea of how the finished product actually looks and can fit into the space available. As such we arrange for customers to visit one our previous installations at a convenient time to both parties. We also like to give new customers the chance to speak with previous customers who can speak first-hand about our workmanship and service.